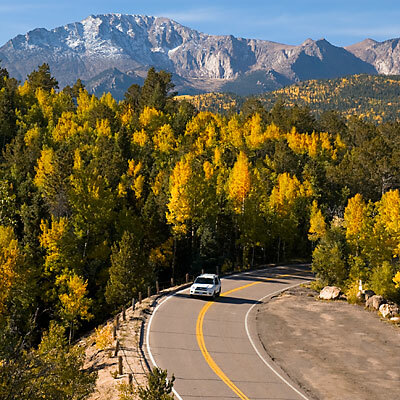 The Pikes Peak Highway is the ultimate viewing experience—almost 20 miles of unbelievable scenery and incredible panoramic views. The Pikes Peak Cog Rail provides a unique and unforgettable experience on the way to the summit. There are no shopping malls or four-star eateries on Pikes Peak, but there are three opportunities to pick up a quick bite and some mementos of your trip. Hundreds of miles of trails can be accessed on and around Pikes Peak. Whether you hike or bike, find one that fits your liking. Though it’s a challenging ride uphill , bicycle riding is allowed on the Pikes Peak Highway. Whether you’re just a kid with a string and a bobber, or a world-class fly caster, the three reservoirs on Pikes Peak provide ample opportunity to put a Rocky Mountain Rainbow Trout in your creel.